Wow, it seems Spirit Airlines – a “budget” airlines – is taking the concept of feeing the customer to death to a whole new level with one of the reportedly “sneakiest fees” in the industry by trying to give it a term that will bamboozle users – “passenger usage fee”. Flyers will now have the joy of paying an exorbitant $34 just for buying tickets on the internet! They always had a fee mind you, but it went from $8.99 each way to $16.99. In certain cases, this “passenger usage fee” could equal 40% or more of a ticket’s total price. But sure, you can avoid this fee, by going to the airport and standing in line and buying ticket. Can you imagine that? Isn’t that what we did like 20 years ago? I Will NEVER Fly Spirit Airlines! They Take The Cake. International Airport Gym listings.. are they coming? 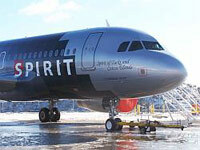 I Will NEVER Fly Spirit Airlines! Part 2! FINALLY! The airlines propose a cool idea.